This plaque is to honor your Young Women who completed their Personal Progress and are awarded the Young Women medallion. Our 8x10 inch plaque has a holder to display a picture of the young woman's picture (up to 3.5" x 5") behind an acrylic cover which is secured by 4 brass screws. 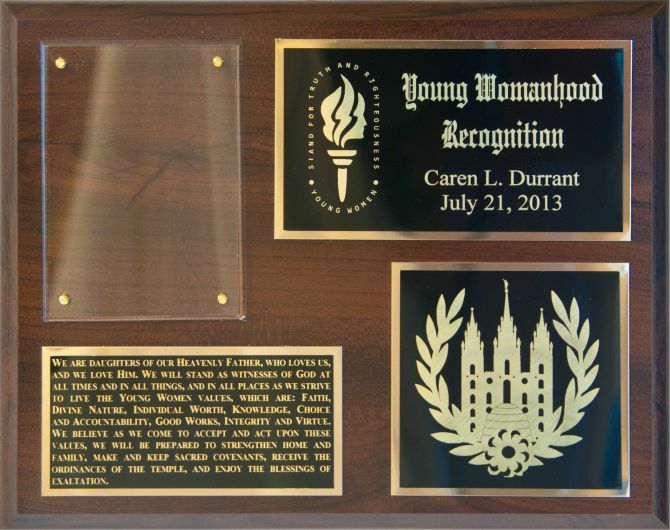 The nameplate features the recipient's name, Young Woman's emblem, and the date of award. The plaque also has a plate with the Young Woman Theme and a plate with the medallion emblem.